The Civic Building at 1 Greys Avenue at the corner of Aotea Square is probably something many Aucklanders pass each day without giving it much of a second look. But did you realise that it is one of the country's finest modernist buildings? Described in a recent NZ Herald article as being 'rarity in a world of concrete and glass boxes' since the architect Tibor Donner (1907-1993) uniquely applied 'Le Corbusier's design principles dating from the 1920s'. This 19 storey steel-frame building was designed in mid-1950s and opened in 1966. It was New Zealand's tallest building at the time and is important because of its use of different technologies at this time. Donner was Hungarian by birth but he moved with his family to NZ and went on to become one of Auckland's most important architects at the time. 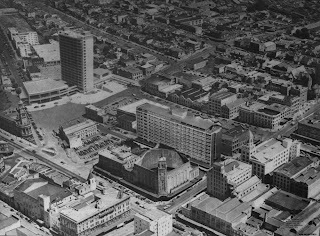 From 1946-67 he was Chief Architect of Auckland City Council and also designed the much loved Parnell Baths and the Pioneer Women’s and Ellen Melville Memorial Hall in Freyberg Square in Auckland’s CBD (which was covered in an earlier blog post, 5 February 2013) along with many other iconic buildings . So next time you are in the area, look up and take in this modernist icon!